In an effort to attract more tourists to Cambodia’s coastline, the annual three-day SEA Festival touched down in Koh Kong and gave spectators a glimpse of a host of sporting activities including swimming, athletics, chess, and Kun Khmer. Among the highlights of the three-day spectacle was the inaugural Jetski event dubbed – Jetski Friendship Competition and saw competitors from Malaysia and Thailand make an appearance. 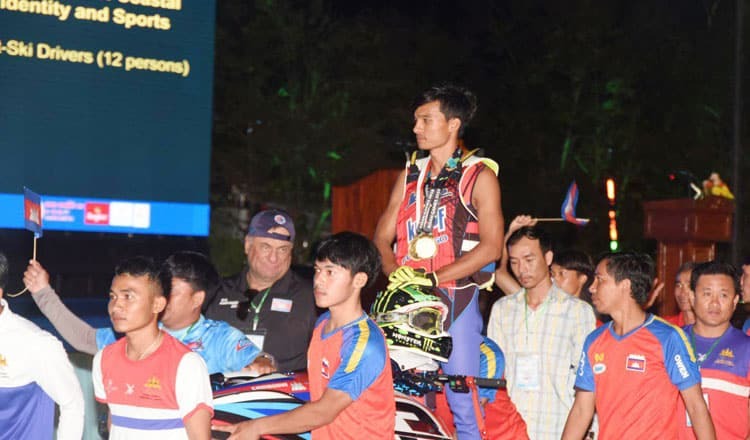 Ou Moeut Saly, Cambodia’s Asian Games Gold medallist also took part. In addition to sports, attendees also witnessed artistic performances, concerts and parades. The festival was this year presented under the slogans ‘Beautiful Bay, Happy Citizen’ and ‘Ecotourism for sustainable green growth and sustainable development’. Organised as a celebration of Cambodia’s entry into the World’s Most Beautiful Beach Club in July 2011, the festival has steadily grown to become one of the premier year-end fixtures since its inaugural Sihanoukville event. The festival received an official opening from Prime Minister Hun Sen on Friday. In his opening address, the Prime Minister appealed to both Cambodian and foreign tourists to visit Cambodia. “I appeal to the people of the whole country and domestic and foreign tourists to come and participate in the Sea Festival, he said. He also called on Preah Sihanouk province authority to restore its image and crackdown on crime. “Sihanouk province must restore its image,” said the Prime Minister. “The issue in Preah Sihanouk Province is not so big, but the people raised this issue as Tsunami or big storm,” he said. “Before, out of our population of 16 million, some flocked to Preah Sihanouk province as there are no places to visit and we have not many tourism sites, so they go to Sihanouk province. Now they visit Kep, Kampot and Koh Kong,” he said. The kingdom’s coastal provinces is set to receive at least 920,000 international visitors by the close of the year with Koh Kong alone seeing 90,000 pass through. Thong Khon, president of the National Olympic Committee of Cambodia, said over 770,000 foreign tourists visited Cambodia’s coastal provinces – up nearly 27 percent compared to the same period last year.